Culex pipiens, the common mosquito, is the main carrier of the West Nile virus (WNV). 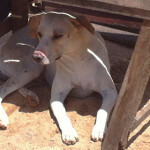 Studying its eating habits is important to establish prevention interventions for the spread of the virus. North-eastern Italy has been affected by the West Nile Virus (WNV) since 2008. It causes, as is commonly called, West Nile fever that affects not only wild birds and pets but also humans. The common mosquito (Culex pipiens) is the main carrier of the virus: through a bite the virus can be transmitted from one animal to another, including humans. To enable the mosquito to accomplish its life cycle it needs to feed on blood of other animals, which are defined as animal-hosts. 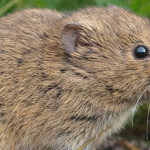 For this reason surveillance has been intensified in the North-East in recent years, aimed at humans and other animals such as horses, wild birds and of course mosquitoes. 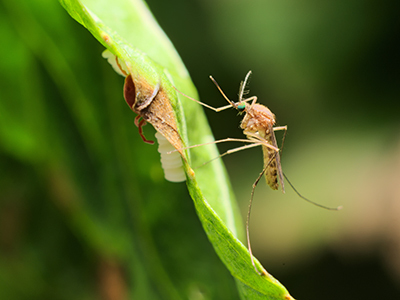 The study of mosquito eating habits is gaining increasing importance as the identification of the preferred host species allows a more accurate picture of the spread of the virus to be created, thus enabling the preparation of preventative interventions. A research project conducted by the Institute Zooprofilattico Sperimentale delle Venezie (RC IZSVe 10/12) studied how the surveillance of the West Nile virus can be intensified through the understanding of the eating habits of the mosquito in relation to wildlife, especially birds. 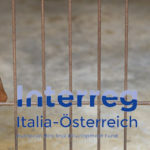 However, in the Veneto region the identification of the preferred bird species of the mosquito, which could be monitored as a reference for the surveillance of the disease, was not clear. An IZSVe research project subjected mosquitoes captured with a network of traps arranged in North East Italy to molecular analysis. The aim was to understand which bird species were preferred by mosquitoes. the abundance of birds in 10 sample sites, characterized by both the presence and the absence of virus circulation. In the period from May to October, engorged mosquitoes (i.e. those that had just taken a blood meal) were captured by traps that were activated for one night in every 15 days. These mosquitoes were immediately frozen at -20 ° C and then subjected to molecular analysis. The sequences obtained, compared with those from specific databases, allowed the identification of the hosts. information already available from previous studies regarding the circulation of the virus in the areas concerned. Of the 1,400 captured mosquitoes, 742 were subjected to molecular analysis. 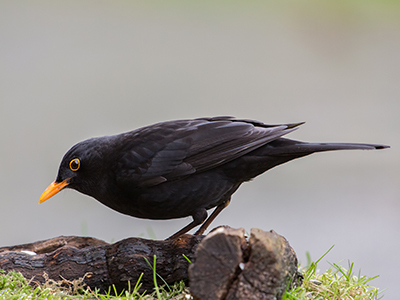 78% had fed on birds; the blackbird and magpie were the preferred species. Of a total of almost 1,400 captured mosquitoes of the Culex pipiens species, 742 were subjected to molecular analysis (PCR method) and 568 sequences were obtained with host identification, on which the mosquito had taken the last blood meal. Of the 56 host species identified 78% were found to be birds, while the remainder were pets, rodents, insectivores and reptiles. The most important result was the identification of the species of birds preferred by the common mosquito: blackbirds and magpies are at the top of the list, followed by the collared doves and sparrows. The dove is less favoured, while the sparrow is chosen opportunistically. However, these birds can be included in the surveillance activity, but as second choices. The domestic chicken should also be taken into account, confirming the wisdom of asking poultry farmers to act as monitors for the dispersion of the WNV. Pigeon and starling results are completely ignored. A second important result came from the crossing of climatological information collected in this study with data from previous surveillance studies. A study carried out in 2012/2013 found that the West Nile Virus was present in 14 sites, while another very similar virus, the Usutu virus, in 29 sites. In addition, the biodiversity of the affected areas was significantly lower in sites with the West Nile Virus than sites with the Usutu virus. What has been achieved by combining this data with the new climatic and environmental information? Species Distribution Model for WNV: The colour gradation shows the level of probability with which WNV can be found in the area. 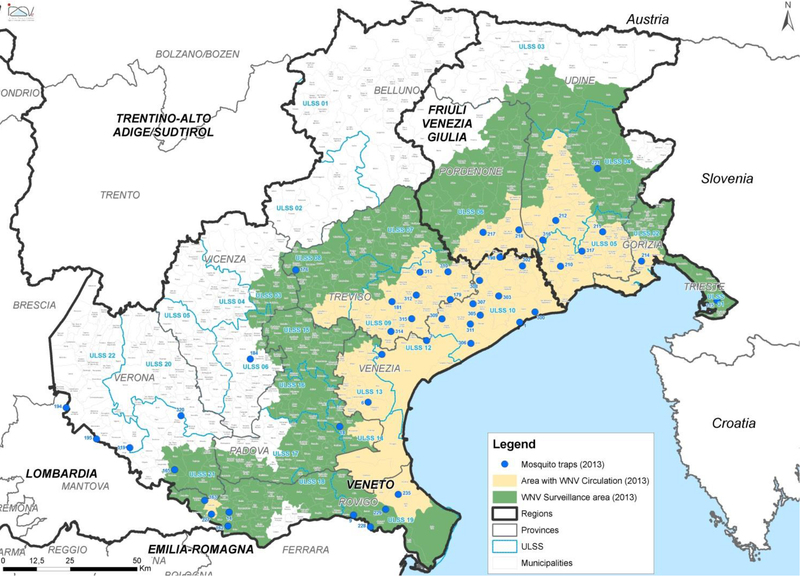 Through research, it was realized that the area most exposed to the risk of WNV circulation is the south-western part of the Veneto. 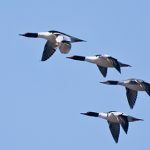 It was found that in order to understand the distribution of the wild bird species the most significant variables were altitude and land cover (although some species were particularly sensitive to other environmental variables). 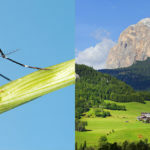 It was discovered that the area most exposed to the risk of West Nile Virus circulation, based on the presence of affected wild birds, is a strip between the Po river and the Adige river, in the southwestern part of the Veneto. In any case, all the low-lying flat part of the region was found to be exposed to a medium level of risk, which is not negligible. 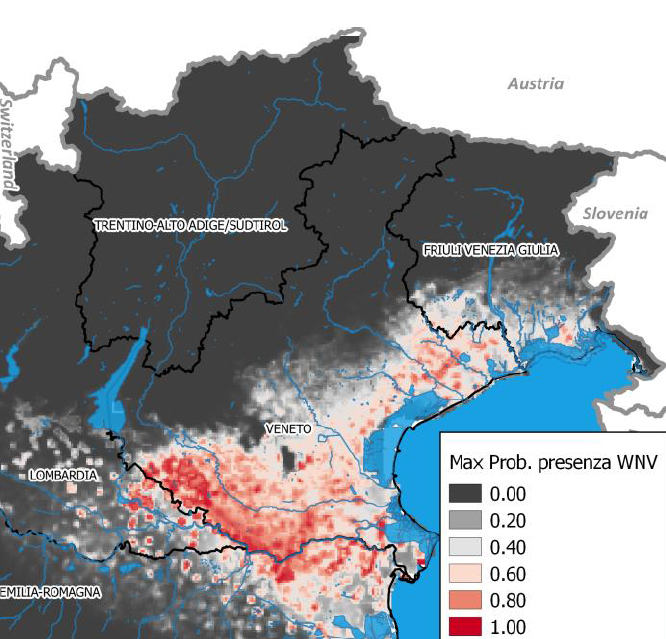 Also parts of the province of Mantua and the Emilia Romagna Region that border with the Veneto region are affected by a high probability of viral circulation. The IZSVe research project was the first attempt to link a study of the Italian hosts of Culex pipiens with the wild bird census in order to define the actual mosquito host preferences in an area in which the West Nile Virus circulates. The study identified the blackbird and the magpie as the target birds to be used in virus surveillance. 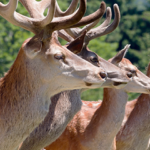 Mammals, including humans, are sparsely represented, as was expected. This, in part, explains the relatively low incidence of WNV in humans, when the Italian situation is compared to that of, for example, Eastern Europe or the US, where there are carriers other than Culex pipiens. The production of maps that allow the identification of areas most at risk of WNV circulation has proved a promising method for increasing the effectiveness of surveillance and prevention of the spread of the virus.